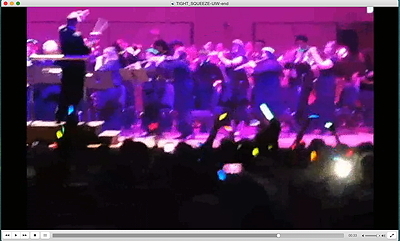 for concert wind band and prerecorded track. 21 pages, 9" x 12". The full, streaming recording of the VanderCook College of Music Symphonic Band's performance of TIGHT SQUEEZE at the 2013 Midwest Clinic, conducted by Charles Menghini. TIGHT SQUEEZE is available as a physical, bound set of score and parts plus audio download, or as a digital set of .pdf score and parts, plus audio download. Mark Reid, Vancouver Technical Secondary School, B.C. Special thanks to CSIC Executive Director Lisa Oman. TIGHT SQUEEZE was premiered February 13, 2013, in Brevard, North Carolina at Brevard College, Miller Asbill conducting. Subsequent regional premieres have occurred across the U.S. throughout 2013 and 2014 by the commissioning partners. The full, streaming recording of the VanderCook College of Music Symphonic Band's performance at the 2013 Midwest Clinic, conducted by Charles Menghini. The front and back pages of the score, including instrumentation and setup notes. Enjoy the Composers and Schools in Concert March 2013 interview with Alex and conductor Miller Asbill, in which they discuss the nitty gritty of scoring with electronics, rehearsing via Skype, and the true value of electricity. Alex has written an extensive two-part article about electroacoustic band music and the uses of multimedia in the concert world. 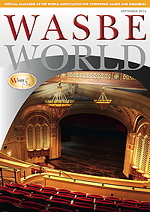 The essay, titled The e-Frontier: Music, Multimedia, Education, and Audiences in the Digital World echoes the presentations she gave at The 2013 Midwest Clinic and the 2014 TMEA convention, and appears in the June and September 2014 issues of the magazine of the World Association for Symphonic Bands and Ensembles, WASBE World. 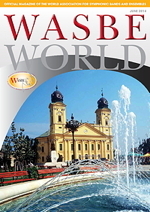 The pdf is offered here with the very kind permission of the organization. PERUSAL ONLY; not for performance or duplication. .pdf file of the TRANSPOSED CONDUCTOR SCORE, 9 x 12; 25 pages including cover and notes. TIGHT SQUEEZE might best be described by the following suggestion: imagine Arnold Schoenberg, Henry Mancini, and Charlie Parker walking into a techno rave club in Havana. And, staying for at least three minutes. On the heels of composing PAPER CUT, which pairs a wind band with not only an electronic track but a ream of printer paper, I knew I wanted to create another even more uptempo, groove-oriented piece that would be fun for fidgety teenagers with the attention spans of diabetic gnats. Okay, even fun for calmer musicians. Unexpectedly, that turned out to feature a twelve-tone row theme-- possibly the world's first for high school band, at least this far west of Vienna. Initially the melody only had eight notes. When I noticed that none repeated themselves, I decided to go for broke, in a tip of the hat to my beloved 90-year old German composition teacher Ursula Mamlok, who was a renowned serialist during the earlier years of her career. The only serialism I've ever been interested in is granola, but I had a good time with this little tone row, which I paired with a techno-rock-infused percussion groove and electric bass line (yeah, I know, Schoenberg did that first), plus a few Latin rhythms and a hint of jazz. Voila: Electroacoustic Twelve-tone Techno Latin Bebop. The twelve pitches are first introduced in all their chromatic glory at bars 7-10, and they reappear in different keys throughout the piece. The music, however, is not really in any key at all, since I only think in terms of keys if I'm locked out of my car. And if I were locked out of my car, this is probably the kind of thing I'd be hearing in my head while frantically trying to get back in. Which leads to the title, which has nothing to do with my car. 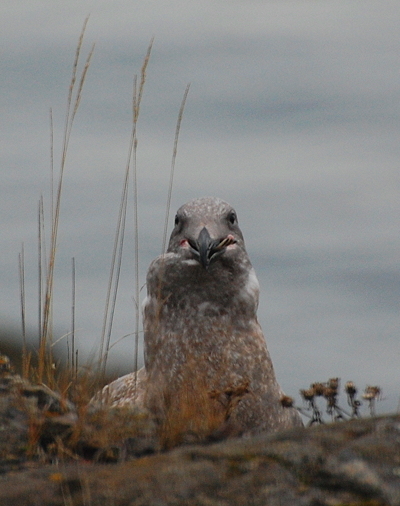 It has everything to do with a young gull who landed on a rock in front of my desk window as I was finishing this music, with a sizable flounder uh, floundering in his clamped beak. 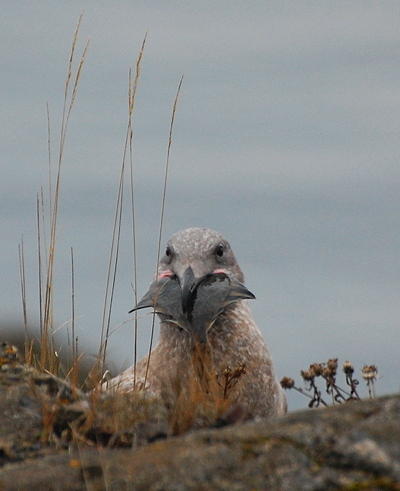 The rather goofy-looking bird was having a challenging time figuring out how to swallow his windfall. I said to the bird, "Wow, tight squeeze! ", and immediately realized that all these notes that were cramming the score page would soon be squeezing through the students’ instruments, as snugly as a fat flounder in a gull's mouth. I also realized that talking to birds is pointless; they make lousy conversationalists. 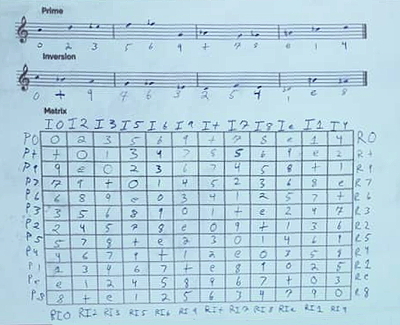 Professor Dylan Rook Maddix used the 12 tone theme from TIGHT SQUEEZE to apply the concept of Serialism to 21st Century music for his Theory IV students at Cambrian College School of Music in Ontario, Canada! Ok, this could be another local flatfish, like a sole, but I'm calling it a flounder just for the halibut because heck, you just don't sea this every day. Click above to watch a very fun ending to TIGHT SQUEEZE, as conductor Brett Richardson gets not only the University of the Incarnate Word Wind Ensemble, but the San Antonio, Texas audience, up and dancing! 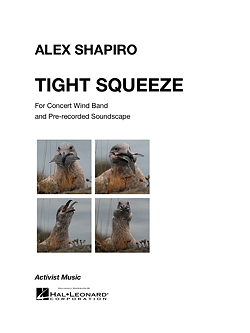 Alex's unique electroacoustic wind band pieces for high school musicians, TIGHT SQUEEZE, and PAPER CUT, are featured in the field's best known book/CD series, Teaching Music Through Performance in Band, Volume 10, edited by Eugene Migliaro Corporon and released by GIA Publications December 2014. 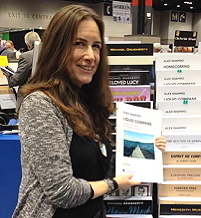 TIGHT SQUEEZE is among the pieces on VanderCook College's CD, 2013 Midwest Clinic: VanderCook College of Music Symphonic Band, on Mark Custom Records. Click CD for more info. TIGHT SQUEEZE, and Alex's LIQUID COMPASS, are among the pieces on the 2016 CD from the DePauw University Band, Everything Beautiful, on Mark Custom Records. Click CD for more info. The twelve tone row theme appears in several keys throughout the piece: it first starts on C, later it begins on D, and somewhere in there it also begins on Bb. Dizzying. Packets of Dramamine should be included with each score set. 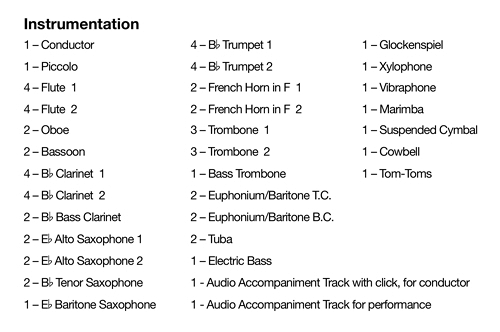 So, students will learn chromaticism by playing almost every note on their instrument! They will learn to pay ridiculously close attention to articulations and phrasing! And maybe even to the band director! And despite all this work, they'll be happy because they get to play really loudly! They'll get a feel for bebop and Latin jazz traditions-- especially important for the players who are not in a jazz band (oh, pity the oboists), but who deserve to play this quintessential American music. Lots of 21st century concert music is infused with various grooves, and classically trained musicians need to be comfortable with all genres. 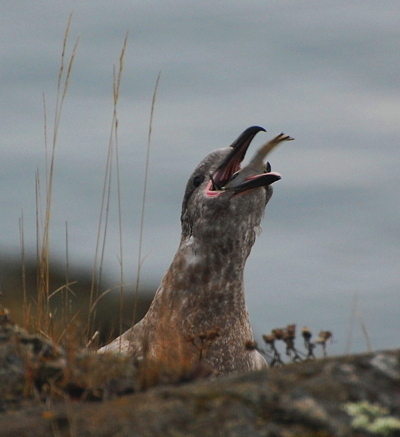 Just like this gull, they should learn to digest everything. (270) 916-0093, and she'll return your call. All photographs by Alex Shapiro (which gives you some idea of what inspires this music!). There's a lot more Shapiro band music to hear! Head on over to THIS PAGE for an overview of Alex's wind band pieces. You can listen to each one, read all about it via a link, and if desired, request a free pdf perusal score. Have fun! ©2000-2019 by Alex Shapiro. All rights reserved to design and content. All photographs by Alex Shapiro.